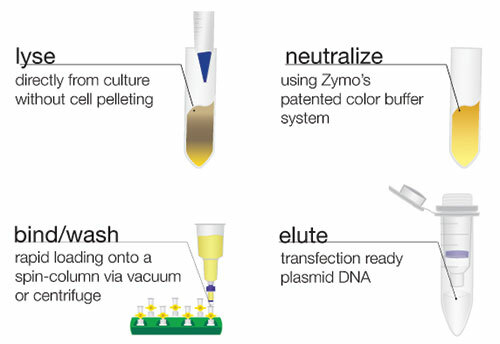 The ZymoPURE™ Plasmid Miniprep Kit yields up to 80 μg of ultra-pure and highly concentrated plasmid DNA. Syringe filters allow rapid lysate cleaning, and the spin-column design allows the binding step to be performed using a vacuum or centrifuge. The ZymoPURE-EndoZero™ Kit uses a modified alkaline lysis method and a unique binding chemistry that yields highly concentrated plasmid DNA, up to 3 μg/μl. The kit includes EndoZero™ spin-columns that reduce endotoxins to 0.025 EU/μg of plasmid DNA. Finally, the ZymoPURE-Express™ Plasmid Midiprep Kit isolates high-quality endotoxin-free plasmid DNA directly from culture in only 15 minutes. By removing pelleting and resuspension steps, highly concentrated DNA (up to 1.5 μg/μL) can be eluted directly from the microcentrifuge column.